"And you,” he told Rudolph, “may yet save the day! Your bright shining nose, son, can show us the way. 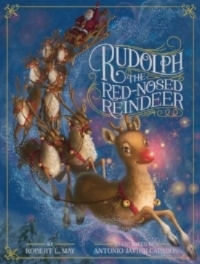 Written as a rhyming poem, Rudolph is a fun book to read out loud. The story is sweet (and different from the story told in the song). It illustrates how a red-nose (something seen as a handicap or deficiency) can become a strength and even save the day. I always hurt with Rudolph when he is made fun of and cheer him on when he saves Christmas. In some ways, Rudolph reminds me of Auggie from Wonder as he inspires us to look for the good in differences and choose kind. Most of us thought it was surely a trap. But before we could do a thing, our Lieutenant Lovell had made his way through the barbed wire and was walking right out to meet the German officer! They met and shook hands. Perhaps an angel of the Lord was among us today-what else could create such spontaneous peace but the hand of God himself? Over 100 years ago, on Christmas day in the midst of World War 1, German and English soldiers called an unofficial truce and celebrated Christmas together. The soldiers met in the middle of no man’s land to bury their dead; then they traded buttons and other items and even took pictures together. Shooting at the Stars, tells this true story through a fictionalized solider’s letter to his mother. 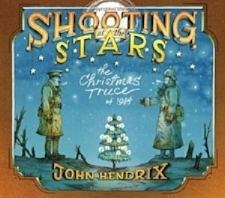 It is a story of peace in the midst of war, a real-life Christmas miracle, and it gives me chills every time I read it. 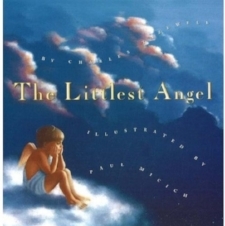 The time of the miracle was very close at hand when the Littlest Angel at last decided on his gift. Then, on that day of days, he proudly brought it from its hiding place behind a cloud, and humbly, with downcast eyes, placed it before the throne of God. While I’m not crazy about the way this story portrays heaven (let’s just say it’s not even close to theologically sound), I love the message it shares. I love that the littlest angel gives his most prized possession to Jesus, that he then feels the deep inadequacy of it, and that God sees the immense value of it and makes it into something truly special. We began our Christmas book collection with this one. I remember reading it as a kid, and I still love reading it now. “Does it hurt? Asked the Rabbit. I always thought some of my childhood toys might be real, the story of The Velveteen Rabbit just confirmed it. I love this story of a stuffed bunny’s desire to become Real. I love how he loves his boy and how his boy loves him. I love that the process is hard and even lonely, but in the end, the rabbit toy is transformed into a Real rabbit through the gift of love and a little nursery magic. From the opening stanzas, this classic Christmas story brings back all the feelings from childhood it originally inspired. It’s such an obvious choice for a list like this, but I can’t not list it. It will always be one of my favorite Christmas-time stories. It infused wonder into my childhood Christmases and continues to bring wonder to my Christmases today. This is a very short list, I know. If you would like a much larger list of Christmas picture books to add to your collection Sarah Mackenzie at the Read Aloud Revival has a large and comprehensive one here. Every year, my goal is to add at least one more book to our collection. Whether newly released or classics of old, I love how so many of the Christmas stories reflect pieces of the original Christmas story. The feelings they inspire, all originate with the reason for Christmas in the first place, Jesus. Even though they may not mention his name directly, most hint at his coming or show us a piece of his character if we look for it. I would love to know your favorite Christmas stories and picture books. Do you pull them out once a year, or leave them out year round?